During the month of November, I always take time to be thankful, no matter how stressful my life is. Would you like to join me? I made up a template where we can share the things (10 of them) we are thankful for! Tips to use template: Right click on it and click "save image as". Open a Power Point doc, insert the image (size it to cover the full page), click insert text box, and type in your list, aligning it to the numbers 1-10. You can also insert an individual text box for each number which is how I like to do it for the Currently Linky from Farley. What a great idea! Thank you for the linky and the inspiration! Bex...I will most definitely be doing this linky...just not tonight. I am right there with you on our Literacy Land blogging buddies. It has been so much fun planning, chatting, and making great things to help our other blogging buddies and followers. Have a wonderful Thanksgiving holiday, and look for my logo tomorrow sometime. Thanks so much for this!! I am absolutely honored to be part of the literacy Land clan! I can't wait to link up! Thanks ladies ! You all rock! I'll link mine up tomorrow, I just linked up for Manic Monday so I was going to wait for tomorrow. Great linky!! Thank you for the invite to the linky party!! 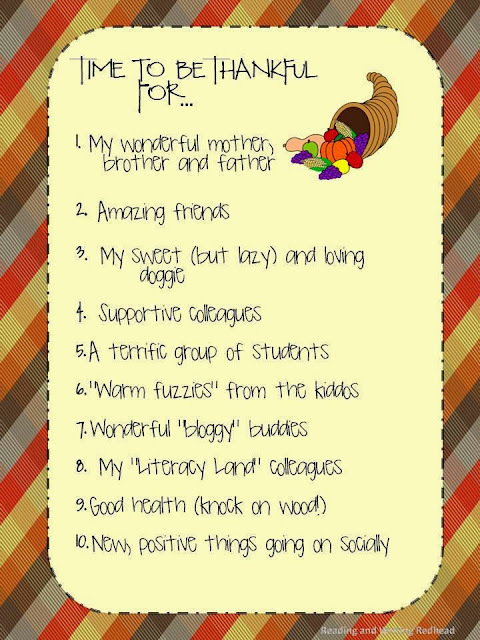 You have a lot of wonderful items to be thankful for!! I hope you have a very, very Happy Thanksgiving!! Happy Thanksgiving, Bex! What a wonderful linky and way to remind us what we are truly thankful for! The Gift of Reading Blog Hop! Frenzy, Blog Hop and 5 for Friday! I'm So Thankful Blog Hop and Giveaway is Here! Blog Hop and a Frenzy Coming Tomorrow! November Currently - time to link up with Farley!